It’s (another) busy week in the world of mobile. Buzz around Apple’s release of the next version of its mobile operating system, iOS 9, and the unveiling of Google’s new mobile-friendly logo have the mobile marketing community relooking at their strategies with an eye to what these two developments mean for them. According to reports, the new iOS 9 will include deep linking of content inside apps as well as the option to block display ads. What this tells us is that Apple understands the growing importance of personalizing the mobile-first customer experience. By deep-linking content within apps, Apple is enabling its customers to be more productive and efficient by removing the restrictions of having to deal with one app at a time, while also empowering them to have a more relevant and personalized experience within the app environment. And ad blocking has the potential to force mobile marketers to move on from a one-size-fits-all banner ad approach to tailored campaigns that speak to a market of one, with personalized, relevant messages. 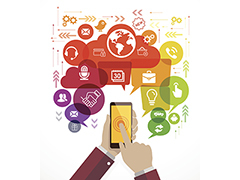 As a result of these advancements, mobile marketers need to pay attention. Although certainly one of its biggest benefits, being able to reach the customer in a timely fashion is just one of mobile’s benefits. It’s about being able to reach customers with relevant information (in a timely fashion) that enables a more personalized, engaging experience. For example, sending a mobile coupon to your customers offering a 20 percent discount is good, but if that discount is for kitchen appliances, and you’re sending it to your complete opted-in mobile database without any filter on demographics, purchasing patterns, or other contextual information, then it’ll likely only be relevant to a small percentage of that database. That means that you’re only going to see a minimal ROI for redemption, and that the majority of customers will simply delete the coupon, or worse, opt out of receiving any further offers from you because they don’t see the value in what your mobile marketing can provide. Google’s new logo sends mobile marketers a much simpler message – it’s a mobile-first world and everything, including your logo, needs to adapt. Google’s new, simpler logo changes depending on whether a consumer is using computer, voice or mobile to search. Mobile marketing is evolving, and these recent developments from two of the world’s biggest brands are yet another indicator of just how responsive and proactive today’s mobile marketer needs to be to keep up and stay ahead of the game. Ultimately, your mobile marketing mantra should remain the same – leverage mobile to deliver an enhanced customer experience with campaigns that reach the right customer, on the right device, at the right time, with the right message. What do you make of Apple and Google’s recent developments? Are they making you relook at your mobile marketing strategy? I’d be interested to hear what your takeaways are from these recent announcements. John Walker is former Vice President of Global Marketing Communications at Syniverse.